Monday night saw the official start of summer, and for my money, that means two things: softball, and bar patios. While we didn't get any swings in, this Monday did see Mick and I venture out to the patio of Chicago's Beat Kitchen, where we spent some patio time with Josh Weaver, guitarist for the white-hot band Royal Thunder. The band's sophomore LP Crooked Doors came out earlier this year, and is a genre-defying medley of damn near all the tropes that make metal and rock great. 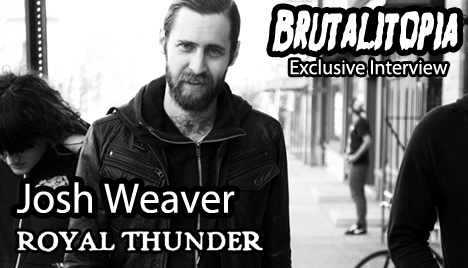 We talked to Josh about Royal Thunder's sound, his writing process, and an indie band called Nirvana he listened to in his youth.